Holding the light a little higher. 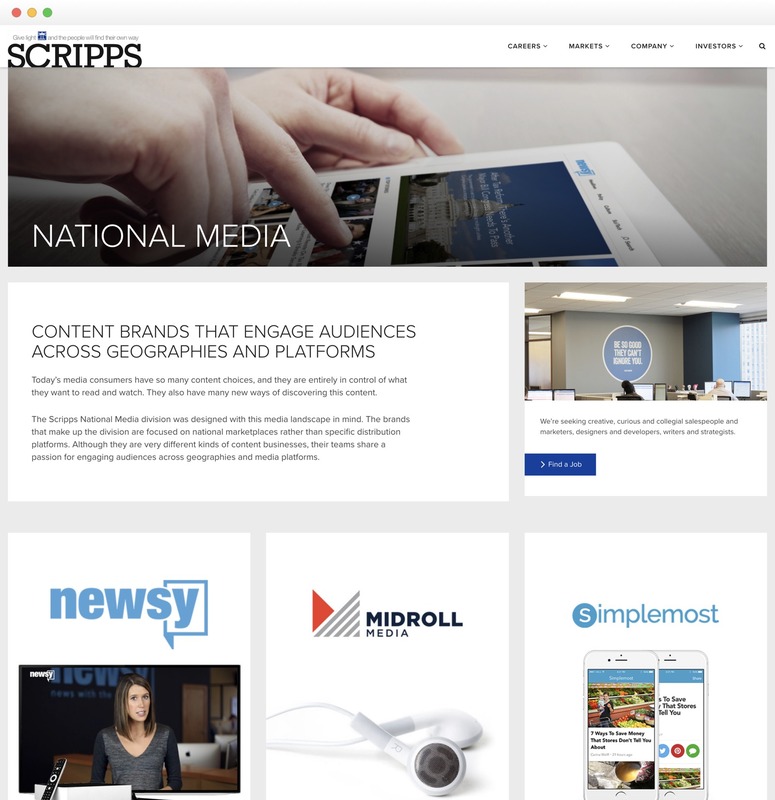 Scripps was in need of a modernized site that would tell the true story of their new business model, in light of their merger with Journal Communications. Where in the past, they were a print-based company, today they are one of the nation’s largest independent Television station owners with 33 stations in 24 markets. Ample worked extensively with their team — interviewing stakeholders at every level, and gaining a better understanding of their mission and goals. We were able to apply the results of these in-depth meetings, to create an online experience that matched the internal culture and their vision of the future. We love where Scripps.com landed. The home page is a powerful introduction to the brand that makes their purpose clear. It balances actions like recruiting with informative content such as their market pages — all in a way that is visually appealing. As you dig into the site you will find well-organized content that offers the complete picture of the vast Scripps media presence, without overwhelming. The new Scripps.com is a beautifully modern site we’re really proud to share, and that’s not just due to Kevin’s alma mater (Ohio University’s Scripps School of Journalism). Go Bobcats!